While deciding on our next trip, we decided on Oregon as a destination by the simple process of elimination. I had a free ticket to fly anywhere within continental United States, the west coast was the farthest we could travel and since California didn’t hold any attraction for me , we switched attention to the next state. 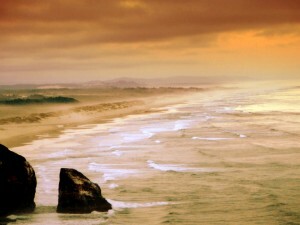 The fact that we had heard a lot about Oregon’s natural beauty clinched the decision. Our idea was to land in Portland, drive east through Mount Hood along the Columbia river gorge and then go south along the Cascades parkway to Crater lake in Southern part of Oregon from which we turn westwards to the central Oregon and coast and then drive back up the Pacific coast to Portland. We landed in Portland airport early afternoon on Friday, after an early morning flight from Baltimore. To reach the airport early enough to grab the window-seats, we had to get up at 3 am: approximately the time I go to bed on most days. Anyway this meant that the long 6 hour flight was just long enough for a good nap. The flight was uneventful, we reached on time and by 11 am Pacific time, we were buckled in our rental Subaru and were on our way outside the city. All American cities are similar—identical strip malls with the same departmental stores and chain restaurants. However move away from the city and the countryside surprises you with its varied landscape. Each area has its own distinctive landscape: Virginia has its rolling green plains, Utah & Colorado with the Rocky Mountains, Texas with its flat landscape. Here the city gave way to dense coniferous forests on both sides of the road. Our first destination was Mt Hood; the journey punctuated by brief stops at the several waterfalls that dot the Columbia River Gorge Scenic highway. The geological peculiarities of this region ensure that it has one of the highest concentrations of waterfalls in Pacific North-west… a claim that we later realized was not just a tourist trap. Of course, we couldn’t see them all but we managed to see the few that were closer to the highway itself. The highlight of all these waterfalls was that we could view each of them from a different perspective. We watched the plunging Latourell Falls from its base, the Shepherd’s Dell falls from high on the bridge watching it originate and fall from above, the Wahkeena falls as a bystander from the side as the water flows past you. THE Water-fall to see was the Multnomah Falls where you can climb on the bridge and view the two tiered waterfall from actually the mid-point. From an historical perspective, the Columbia River Gouge area is significant as Lewis & Clark expedition (first planned expedition to map the West and find an alternate route to the Pacific) in early 1800s figured that the Columbia river was a way to reach the Pacific Ocean. But we continued the water theme by making a brief stop at the Bonneville Dam. Large volumes of gushing water is always wonderful to watch as is the architectural and engineering wonders of a dam but what made this place stand out for me was the fish swimming upstream. 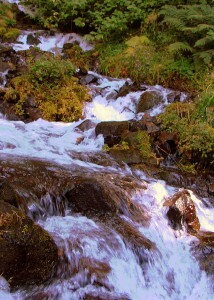 The Columbia River is the route that the salmon take to journey upstream to lay eggs. Let me digress a minute to explain the salmon lifecycle – they are born in streams or rivers in freshwater where they spend the initial few years after which move downstream to reach the sea where they live the life of sea water fish till some internal clock tells them its time to reproduce. At this time they travel upstream from the sea to the river or the stream where they were born and then produce the next generation of salmon. Coming back, the Bonneville dam was built right in the way of the poor salmon’s commute. 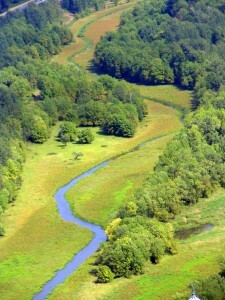 Therefore, to provide the salmon a path to overcome the barriers and reach the streams, “fish-ladders” are created. These are a series of low steps that provide an alternate route that fish can take while swimming upstream rather than be “damned”. The day we reached there was one of the peak days for Chinook Salmon to swim upstream Mondays—around 7700 salmon had passed the fish-ladders the previous day. It was kind of fun to see these 40-50 pound fish trying to swim against the strong current—they would get pushed back at the ladders a couple of times but then surge ahead to move on. We carried on towards Mt. Hood with a brief snack stop at one of the pear orchards on the way. It is difficult to describe the scenic splendor of this region—fruit orchards on either side with a snow capped Mt. Hood in the distance. The end of the day was with a brief stop at the majestic but surprisingly empty Mt Hood. Sunny days are not exactly welcome in this ski-resort area, apparently. Ended the say with some Pacific Northwest cuisine at a restaurant called Rendezvous. We ended the previous day after seeing many waterfalls and ending at a mountain. Today was the reverse of that. We started off sightseeing with a mountain and ended with several water-bodies (lakes). 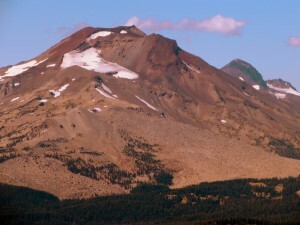 We had an uneventful drive to Mt Bachelor in the morning, marveling at the way the landscape changed so quickly. We passed green fertile farmlands, large area of barren land with only burnt down trees , a desert-like landscape with nothing around, dense forest like areas with coniferous trees densely packed together and areas that looked like fruit orchards—all within a space of 2 hours. We only passed a tiny town by the name of Madras! After a quick up and down Mt. Bachelor using the ski-lift we entered Cascades parkway. After which we proceeded with a lot of stops along the way – stopping at various lakes that are on either sides of the parkway. It was a series of get-down at the lake area, marvel at the beauty, click a few snaps , look at the watch , sigh and move on to the next lake where the steps were repeated. We wanted to get to Crater Lake by sunset. Crater Lake was formed when a volcano erupted through a mountain causing the mountain to cave in and cause a caldera. Rain water and snow filled the caldera with water and now it is the deepest lake in United States. The waters are an impossible blue – getting to the lake requires a treacherous hike down to the water surface and therefore there is limited human activity in the lake. The lake has ~ 20 mile drive around its rim—unimaginatively called Rim Drive with various pullouts where you can stop and view the lake at different angles. We reached it just in time for sunset. At Crater Lake national park, we were high above sea level — in the distance you could see multiple mountain ranges one after the other. The sunset was easily one of the best sunsets I have ever seen. But the magic started after the sunset ,while we drove to out B&B. It was pitch dark , forest area , no other lights except millions and million of twinkling stars. I don’t believe I have seen that many stars –EVER. While selecting hotels during vacation trips, I never actively sought out Bed & Breakfast places. A mistake—which I am glad to report I corrected recently. Most B&B places are run by people who rent out rooms in their own houses and feed them a nice breakfast in the morning. Unlike most people who can afford to take two weeks of vacation to go to one place and spend a few days relaxing at a vacation home or a beach house, we who horde our vacations to make the annual India trip can’t afford that luxury. I have found that staying at B&B hotels during trips can provide you the feeling of relaxation despite not having enough number of days. It is incredible to me to see these elderly people in remote locations open their houses to welcome complete strangers. We stayed at Crater Lake Bed and Breakfast run by Janet and her son Tony. They rent out two rooms in their house –ours was what they called the nautical room. It was well named because there were atleast 25-30 ships on display in the room not to mention pictures of ships, old chronometers and sea-shells. They made us feel very welcome and we loved the night we spent at their place. It is highly recommended! But better than the house and the delicious breakfast that Janet made was the view I saw when I woke up in the morning. Right in front of the house was a big green meadow with hundreds of cattle peacefully grazing away as far as I could see. It was kind of cool to wake up to sound of cows mooing away. They were beef cattle from California is what Janet informed us over breakfast—brought down to Oregon in summer to fatten up before they end in McDonalds! Anyway we started back to Crater lake after a heavy breakfast and did another round of the Rim Drive and a couple of short hikes to get better views of the lake. We also stopped briefly at Pinnacles—a strange formation caused by the gases exiting the volcano causing long hollow funnel like structures called fumaroles. Quick pit-stop later , we were back on the way to the coast. We drove up the Pacific coastline on a cloudy day with the mists coming inland looking hard for a patch of blue sky. The mists cleared somewhat to help us take a few pictures. The highlight of the morning was when we stopped at a pullout just because we saw a couple of people there… On the rocks in front of us were several seals and sea-lions sunning themselves! This was also a place where we could see tidepools. A close observation of the rocks showed several different creatures clinging to the surface. Multicolored starfish, mussels, sea anemones , sea cucumbers and giant kelps. Having never seen such creatures outside of an aquarium it was quite exciting to see the bright colors that they have. The other highlight of the trip was at Depoe Bay. Right along the middle of the city—several whales had taken up residence in the bay nearby. One of them graced us by its presence, moved up and down the water to signal its presence and then floated away. The rest of the drive was very beautiful. We stopped at several look out points, clicked tons of photographs and admired the beauty of the sea-coast. I have probably used all synonyms for beautiful, great and amazing but like they say—words cannot express it all. We reached the city of Tillamook at 5 pm in the evening. 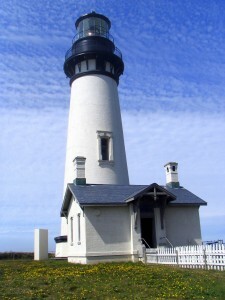 Tillamook is famous for its cheese and ice-cream. We did a brief tour of the factory , sampled both the cheese and ice-cream , brought a few souvenirs and moved on to get back to Portland by nightfall. And now let me tell you the real reason of selecting Oregon. The easiest task I had was to book a hotel in Portland. Normally I’d try & make sure it covered a lot of criteria in terms of amenities and cost but this time it was simpler. All I had to do was to find the closest hotel to Powell’s bookstore. 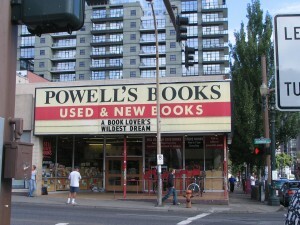 Anybody who buys second hand books will know the name of Powells— they have a huge store in Portland. I was excited when I saw that the store comes with its own map and they even provide guided tours. It was a huge store—one block long, it had several other stores in Portland itself. One of them dedicated to just technical books was located just around the corner. Anyway I spent a good amount of time browsing the books, selecting a few to buy and generally enjoying the feeling of being in a genuinely big book-store. The prices were not as cheap as those you find on the internet but of course buying directly avoids the S&H charges. I am not sure how I’ll go back to Barnes and Nobles! We reached back home past midnight. It was a good trip— completely recharged myself. Photos posted here. Yellowstone - a photo diary. A sneak peak at Annika’s diary. Around the World in Seven Days! Why I liked "Main Madhuri Dixit Kyon Banna Chahti Hoon"
Copyright 2019. Bookmarks. (www.finebalance.net) All Rights Reserved.